Ahh, spring! The weather gets warmer, trees get new leaves, flowers start blooming, grass gets greener—so many reasons to (finally) get outside! If you’re like us, beautiful spring weather leaves you longing for a glam garden party to celebrate the season. The good news is that garden parties look super fancy, but they really aren’t that hard to pull off. As long as you have some flowers, a cute outfit, simple decorations, and a few snacks, you can have the garden party you’ve always wanted. Get things going by treating yourself to a fancy new outfit. Honestly, having a cute dress to show off makes throwing a garden party even more exciting. Not sure where to look? Try Modcloth. Whatever you picture when you think “garden party dress”—Modcloth probably has it. And it doesn’t matter if you’re into florals, stripes, polka dots, or solid, bright colors; you’ll look amazing in whatever you choose. Next up: festive decorations. Flowers are obviously a garden party staple, so start by grabbing some cute vases to fill with your favorites. And if you don’t have a garden to get your flowers from (not everyone has a green thumb), picking some up from a local florist or even getting fake ones from a craft store are also acceptable. Place 2 or 3 vases on your outdoor table, and if you have any extras, put some around the party area (like a patio), in the entryway of your home, and even the bathroom. You want your home to look like it’s totally in bloom! Think your table setup needs fine china and your best silver? Think again! No need to worry about clumsy guests shattering your wedding gifts, you can can get expensive-looking silverware, plates, and glasses just about anywhere. Check places like Target, Amazon, or even your local party store. Hint: we just saw some cute, sparkly plastic champagne flutes at Target (yes, we’re breaking out the bubbly for this party!). If you can, hang some string lights in your backyard. They really do add an extra magical touch to your party, especially if it’ll last past sunset. And don’t overcomplicate things—just repurpose your white holiday lights! You know what they say: Dessert first! Start by preparing delicious carrot cake cupcakes; a quintessential treat for spring. First, preheat your oven to 325°F and place cupcake wrappers in a muffin tin. Use the paddle attachment of a stand mixer to combine eggs, sugar, and vegetable oil. In a separate bowl, mix the flour, baking soda, baking powder, cinnamon, allspice, and salt. Add the flour mixture to the stand mixture gradually. When ingredients are just combined, stir in the carrots. Place mixture in cupcake wrappers, filling each about ⅔ of the way. Bake for 20–25 minutes, or until a toothpick comes out clean. When they’re done, place them on a rack to cool. Using your stand mixer again (the paddle attachment), beat the cream cheese until it’s smooth. Then add in the butter and vanilla and beat until they’re combined. Then add the powdered sugar with a sifter and beat until the frosting is creamy. When the cupcakes are cooled, top them with frosting. 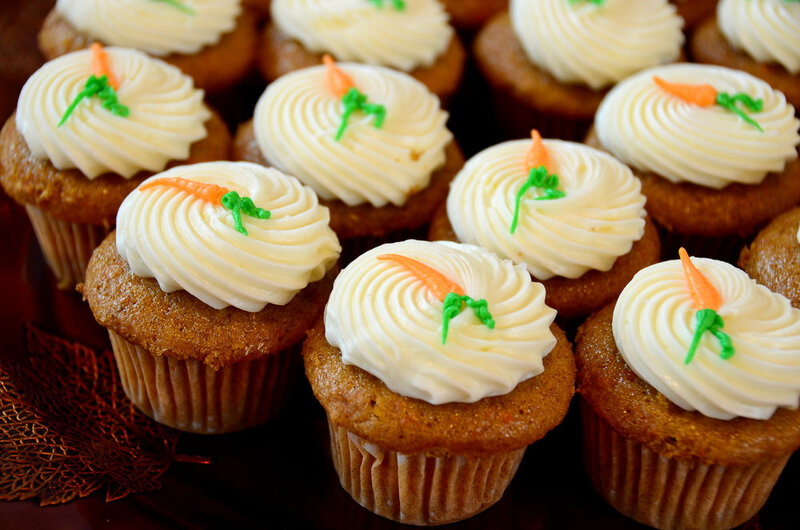 (And if you have green and orange colored frosting, you can draw little carrots on top of each cupcake.) Then, place them on a tiered cupcake stand to take your presentation to the next level (literally). It’s not a garden party without dainty cucumber sandwiches, now is it? Good news: You can whip these up in a matter of minutes, and they also look extra fancy on a tiered tray. Spread a thin layer of butter on one side of each slice of bread. Then, over 4 of the slices, place one layer of cucumber. Next, mix together the mayo, chives, mustard, and a pinch of salt and pepper in a bowl. Spread a thin layer of this mixture over the cucumbers, then top with the other 4 slices of buttered bread. Finally, cut the crusts off each sandwich and slice into three fingers (or cut them into triangles if they’re more your style). Remember those champagne flutes you got? This is why. Doesn’t a strawberry champagne punch sound super delicious? It’ll be a hit with your guests, too! We recommend making this right before guests start to arrive (make it too early and it might go a little flat). Combine the champagne, ginger ale, and strawberries in a large punch bowl. Stir and serve! Want to make it look even more elegant? Pour the cocktail into the champagne flutes yourself, and then arrange and serve on a glass or metallic serving tray. Parties are a lot of fun, but hosting can still feel a little stressful, even if the prep is pretty simple. The best way to take the stress out of hosting? Pamper yourself while getting ready! When you’re done prepping your food, wash up with a luxurious hand soap. We recommend When in Foam™ Pear, Plum, and Sparkling Strawberry Foaming Hand Soap. The sulfate-free lather and sparkling scent will help put you in a spring-like mood. Then, head to your room to freshen up. Throw on your softest robe, spend 10–15 minutes relaxing with your favorite face mask on, and enjoy a little bit of calm before the excitement begins. We love 24 Carrots™ Nourishing Face Mask, not only because it’s perfect for spring, but because it helps nourish and soften your skin so you’ll look radiant and glowy during your party. When you’re done rinsing the mask, apply your makeup. Start with Dew Me Right™ Hydrating Skin Stick under your foundation. It’s a refreshing blend of coconut water, witch hazel, and mushroom extract that cools and hydrates as it primes your skin. Ahhh! And don’t be afraid to use a little pop of color, either! This party is the perfect excuse to rock a bright lip or that colorful liner you feel like you never get to use. Try a bright pink with Get Some Vial™ shade. Plus, it’ll last throughout the whole party so you won’t have to touch it up! Finally, it’s outfit time. Grab your amazing new dress and get ready to party! If you want to, you can add one more floral finishing touch—parting gifts. As the party winds down and your guests are on their way home, give them a little treat to thank them for coming. We love Nip it in the Bud™ Big Fat Yummy Hand Crème. The non-greasy formula makes hands feel amazing, and its jasmine, gardenia, rose, and juniper berry fragrance will remind guests of how perfect your garden party was every time they use it.